Mekonnen, T., K. Kefelegn, G. Abebe, and A. L Goetsch. 2013. “Effects Of Levels Of Boer Goats And Dorper Sheep On Feed Intake, Digestibility, Growth, And Slaughter Characteristics In The Central Highlands Of Ethiopia”. Journal Of Animal Science. Journal Of Animal Science. .
Tsukahara, Y., A. L Goetsch, T. A Gipson, J. Hayes, R. Puchala, and T. Sahlu. 2013. “Effects Of Adaptation And Meat Goat Breed In A Method To Evaluate Electric Fence Additions To Barb Wire Fence For Goat Containment”. Journal Of Animal Science. Journal Of Animal Science. .
Merkel, R. C, T. A Gipson, Z. Wang, and A.L. Goetsch. 2013. “Effects Of Level And Length Of Supplementation On Carcass Amounts And Percentages Of Ash, N, Water, Total Fat, And Energy”. Journal Of Animal Science. Journal Of Animal Science. .
Askar, A. R, R. Puchala, T. Gipson, K. Tesfai, G. D Detweiler, A. Asmare, A. Keli, T. Sahlu, and A.L. Goetsch. 2013. 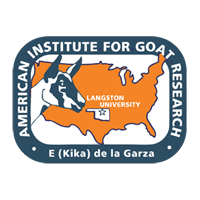 “Effects Of Stocking Rate And Physiological State Of Meat Goats Grazing Grass/forb Pastures On Forage Intake, Selection, And Digestion, Grazing Behavior, And Performance”. Journal Of Animal Science. Journal Of Animal Science. .
Keli, A, A. L Goetsch, T. A Gipson, R. Puchala, S. Zeng, G. D Detweiler, and K. Tesfai. 2012. “Effects Of Pasture Access Regime On Yield And Composition Of Milk Produced By Alpine Goats”. Xi International Conference On Goats. Xi International Conference On Goats. Zhong, R. Z, Z. Wang, D. W Zhou, A. L Goetsch, and T. Sahlu. 2012. “Effects Of (-) Epigallocatechin-3-Gallate (Egcg) On Viability Of Haemonchus Contortus And Immunie Responses In White Blood Cells Of Goats In Vitro”. Xi International Conference On Goats. Xi International Conference On Goats. Puchala, R, A. L Goetsch, A. Manley, T. A Gipson, and T. Sahlu. 2012. “Prediction Of Heat Production In Boer Goats Using Heart Rate”. Xi International Conference On Goats. Xi International Conference On Goats. Gipson, T. A, and A. L Goetsch. 2012. “Spatial-Temporal Movements Of Grazing Goats”. Xi International Conference On Goats. Xi International Conference On Goats. Yiakoulakia, M. D, A. L Goetsch, G. Detweiler, and T. Sahlu. 2012. “Effects Of Creep Grazing And Stocking Rate On Diet Selection And Nutritive Value Of Does And Kids”. Xi International Conference On Goats. Xi International Conference On Goats. Tsukahara, Y, T. A Gipson, G. D Detweiler, T. Sahlu, and A. L Goetsch. 2012. “Factors Affecting Behavior Of Goats In Pens With Electric Fence Strand Additions To Cattle Barb Wire Fence”. Xi International Conference On Goats. Xi International Conference On Goats. Tsukahara, Y, T. A Gipson, R. Puchala, T. Sahlu, and A. L Goetsch. 2012. “Factors Influencing Feed Intake, Growth Performance, And Behavior By Boer Wethers With An Automated Feeding System”. Xi International Conference On Goats. Xi International Conference On Goats. Merkel, R, C. K Liu, N. Latona, El A. A'mma, and A. L Goetsch. 2012. “Effects Of Level And Length Of Supplementation On Leather Characteristics Of Yearling Boer And Spanish Wethers”. Xi International Conference On Goats. Xi International Conference On Goats. Goetsch, A. L, and T. A Gipson. 2012. “Goat Nutrition Based On Grazing”. Xi International Conference On Goats. Xi International Conference On Goats. Puchala, R., Z. Wang, A. L Goetsch, and T. Sahlu. 2012. “Ruminal Methane Emission By Boer And Spanish Does Supplemented With Garlic”. Journal Of Animal Science. Journal Of Animal Science. .
Tsukahara, Y., T. A Gipson, G. D Detweiler, T. Sahlu, and A. L Goetsch. 2012. “Effects Of Meat Goat Breed, Gender, And Conditions Before And Between Measures On Behavior In Pens With Barb Wire And Electric Fence Strands”. Journal Of Animal Science. Journal Of Animal Science. .
Gipson, T. A, S. P Hart, and R. Heinemann. 2012. “Gis Grid Analysis Of Utilization Of Adjacent Pastures By Two Herds Of Goats”. Journal Of Animal Science. Journal Of Animal Science. .
Zhong, R. Z, Z. Wang, D. Zhou, A. L Goetsch, S. Hart, and T. Sahlu. 2012. “Anthelmintic Efficacy Of Medicinal Herbs In Goats Infected With Nematode Parasites”. Journal Of Animal Science. Journal Of Animal Science. .
Goetsch, A. L, G. D Detweiler, Z. Wang, J. Hayes, K. Tesfai, and T. A Gipson. 2012. “Different Supplement Treatments For Lactating Meat Goat Does Grazing Grass/forb Pastures”. Journal Of Animal Science . Journal Of Animal Science . .
Hart, S., S. Genova, D.M Haines, and B. Bah. 2012. “Efficacy Of A Bovine Colostrum Replacement Product For Goat Kids”. Journal Of Animal Science . Journal Of Animal Science . .
Merkel, R. C, T. A Gipson, Z. Wang, and A. L Goetsch. 2012. “Effects Of Level And Length Of Supplementation On Bw And Harvest Characteristics Of Yearling Boer And Spanish Wethers”. Journal Of Animal Science . Journal Of Animal Science . .
Zhong, R. Z, Z. Wang, A. L Goetsch, S. Hart, and T. Sahlu. 2011. “Comparison Of Nematode Parasite-Susceptibility And Performance Of Boer And Spanish Goats Supplemented With Garlic”. Journal Of Animal Science 89(E-Supplement 2). Journal Of Animal Science . Lu, C.D., and M.J. Potchoiba. 1988. “Milk Feeding And Weaning Of Goat Kids — A Review”. Small Ruminant Research 1 (2). Small Ruminant Research: 105 - 112. doi:10.1016/0921-4488(88)90025-9. http://linkinghub.elsevier.com/retrieve/pii/0921448888900259. Lu, C.D. 1989. “Effects Of Heat Stress On Goat Production”. Small Ruminant Research 2 (2). Small Ruminant Research: 151 - 162. doi:10.1016/0921-4488(89)90040-0. http://linkinghub.elsevier.com/retrieve/pii/0921448889900400. Lu, C.D., M.J. Potchoiba, T. Sahlu, and J.R. Kawas. 1990. “Performance Of Dairy Goats Fed Soybean Meal Or Meat And Bone Meal With Or Without Urea During Early Lactation”. Journal Of Dairy Science 73 (3). Journal Of Dairy Science: 726 - 734. doi:10.3168/jds.S0022-0302(90)78726-7. http://linkinghub.elsevier.com/retrieve/pii/S0022030290787267. Lu, C.D., M.J. Potchoiba, T. Sahlu, and J.M. Fernandez. 1990. “Performance Of Dairy Goats Fed Isonitrogenous Diets Containing Soybean Meal Or Hydrolyzed Feather Meal During Early Lactation”. Small Ruminant Research 3 (5). Small Ruminant Research: 425 - 434. doi:10.1016/0921-4488(90)90073-F. http://linkinghub.elsevier.com/retrieve/pii/092144889090073F.